Kim Sutherland is the founding Musical Director of Hunter Singers and the Head Teacher of Creative and Performing Arts at Merewether High School. 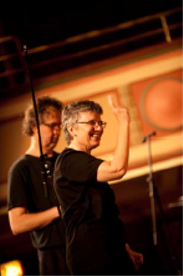 After graduating from Sydney Conservatorium, Kim studied conducting with Myer Fredman and Mats Nilsson, completed a Master of Creative Arts degree at the University of Newcastle and won the Wesley Institute Orchestral Conducting Competition in 1999. Kim’s creative approach to the leadership of Hunter Singers has been widely recognised both locally and at state level. She has received numerous conducting and teaching awards, including an Australian Council of Education Quality Teaching Award. She was also selected as one of the four finalists in the Newcastle division of Energy Australia’s Community Spirit Awards. Kim has conducted excerpts from Vivaldi’s Gloria in the Sydney Opera House and has also conducted the Newcastle University Choir for performances of the Fauré and Rutter Requiems and Bach’s St John Passion. With Hunter Singers, Kim has been involved in commissioning new works by Australian composers, produced two CDs and toured overseas on seven occasions, to the United States, Europe, New Zealand, Canada and Italy. 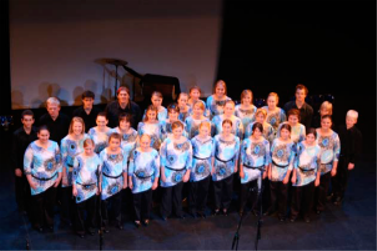 Performances in Salzburg Cathedral, the Llangollen International Eisteddfod and the Verona Choral Festival provided the young choristers of Hunter Singers with the thrill of international competition and opportunities for individual growth and development – and memories that will last them a lifetime.